A shortage of nurses compared to demand has existed to some extent for twenty-five years and yet today’s shortage is uniquely serious. The retirement of baby boomers, the aging population and the associated increase in healthcare needs of our nation’s largest generation has intensified the issue, leading to the need for more nurses and supporting healthcare workers across the state. Nursing forms the base for the economic engine for North Dakota’s communities. The rural North Dakota landscape makes this shortage particularly acute due to the limited program capacity and distance. Over the last two years, the Governor’s Nursing Shortage Task Force met to develop a set of strategies for ensuring a healthy nursing workforce. The final report and supporting data are available on this page. 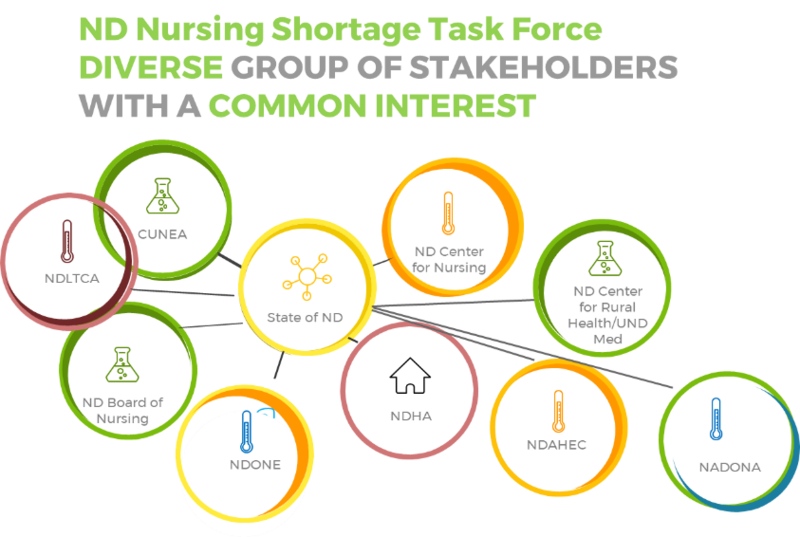 These strategies are the collective work of multiple entities including the ND Center for Nursing Board of Directors and Leadership team which represents over 40 nursing organizations, North Dakota Hospital Association, the North Dakota Long Term Care Association and Governor’s task force members. The report includes fourteen strategies which form an interoperable plan. These strategies are all listed below. All of these strategies are needed in order to fully address the complex issue of the nursing shortage. Several of these strategies have been completed or are in progress without state support. Six of these strategies require legislative support during the 2019 session. The nursing shortage has wide ranging impacts. Below are testimonies that have been submitted by nurses reflecting on the importance of the Legislative Solutions. I wish there was more available in the form of tuition support for current faculty to further their education. I would love to get my Masters to further grow the Nursing Program in our small hospital but would be paying the entire cost of tuition out of pocket and I just can’t make that work right now. I have not been in academia long, but neither have my colleagues. Unfortunately, there is significant turn over with nursing faculty. Many reasons may apply, but the most prominent is our low salaries. Many of my colleagues work additional part-time jobs to be able to “afford to teach.” My husband has commented multiple times that I am “basically working for free”, “crazy to continue to put the number of hours and degree of stress into an occupation that pays so little and a system that is so broken,” and “if it wasn’t for the fact that you love teaching and helping your students grow, I would ask that you quit teaching.” It is a slap in the face, when our graduates’ starting wages are better than our seasoned faculty. How are we (current faculty) to recruit new, qualified faculty when the job description is more hours and less pay? I have many nursing friends that would love to get into academia, but “cannot afford to take the pay cut.” We cannot fill the nationwide nursing shortage without qualified faculty and high rates of faculty turnover. Nor can we reduce turnover, if we do not have seasoned faculty to mentor the new. Our wages need to be brought up to or above the national standard, otherwise, I fear we will continue to loss nursing faculty and potentially schools of nursing. I am in my first year of being a Clinical Instructor for the Dakota Nursing Program out of Dakota College Bottineau. Previous to this job I was a Certified Wound and Ostomy Nurse and floor nurse for a local nursing home for 20 years. It was a position that allowed me to have weekends and holidays free. I enjoyed this job but felt that I would enjoy instructing nursing students more. I accepted the Clinical Instructor position and looked forward to a new phase in my nursing career. My decision has been a costly one. My wages have dropped by about $30,000/year. The state benefit package does not make up for that. Prior to accepting this position my spouse and I sat down and figured out a budget that we felt would work. We knew it would be a difficult transition but agreed to give it a try with the thought that a return to public nursing would still be an option. I had thought that I could make up some of my income by taking an “on-call” position but the meetings, retreats, tending to emails and the tasks that go along with any job makes scheduling in another job very difficult. While I love my job and feel that this is another career step I can grow and excel in I find myself facing another decision: Can I afford to stay in the Clinical Instructor job and still be able to save for retirement and do some of the things that make life worth living? I’m not sure yet. I certainly hope I can make it work but I also need to secure my financial future. If I leave then what would be the cost to the Dakota Nursing Program? DNP would need to spend resources on recruitment for another faculty member as well as the cost of the first year in training. DNP will also be losing a nurse with 20 years of nursing experience. I came to Williston, ND in 2010 to follow my husband who came earlier to work in the oil field. I was very interested in going to the local college to obtain my RN license. However, they wanted me to retake all the courses I had already graduated in as I had been out of school too long. This didn’t make any sense to me as I have been working in the nursing field as an LPN for 34 years in many different areas and obtained much knowledge and experience with no need to retake courses I already was accredited in. I found this to be a big road block to even consider going back. I know there is a big need for experienced nurses as myself here and it doesn’t make sense to pay out money for classes I’ve already taken besides what else I would need to make it worth my while at my age. So if you can make it affordable and take away the road block of retaking courses you already graduated in, you might keep me working for a longer period of time. I work in a small rural area that supports a 2-year institution. We have awesome faculty but because of the low salary keeping that faculty has been a challenge. There are several 4-year universities in the state in bigger cities. Their salaries are quite a bit more and then ours but still lower than the national average. It can be hard to go into education when you can make so much more working in healthcare facilities. However we need educators in order to produce high quality nurses. As a staff nurse, I make at least $6-$7 more than what instructors are making. These are the ones that are teaching nurses to be nurses. There needs to be more incentive to instruct. Some of us aren’t impressed by the Monday though Friday gig. I, personally don’t mind working weekends and holidays most of the time. If instructors made as much or close to what staff/floor nurses make it would be more incentive to move to the teaching aspect. Also, more funding for furthering your degree for education is not a bad idea. For the past five years, I have an ad out for a nursing faculty for two of my satellite nursing sites (Minot and Valley City). Dakota College at Bottineau pays their nursing faculty the lowest of all the nursing program across the state, which makes it hard to recruit and maintain faculty. Dakota College at Bottineau administrators have been very supportive to the nursing program by making some adjustment to the nursing faculty salaries, as much as they possibly could. However, the continuation of budget cuts hinders DCB’s ability to be grow our nursing program, along with being competitive in recruiting qualified nursing faculty. Recruiting nurses from the healthcare systems to come to work in nursing education cost them a lot of money. They take approximately 10 to 15% cut in salary, plus they have the added expense of student loans from their graduate programs. I have lost good, qualified nursing faculty due to them returning to work in healthcare for better pay. The DCB nursing faculty that have continued to work in the nursing program have extra duties to help compensate their low wages. I feel North Dakota cannot afford to lose good quality healthcare. Good quality healthcare begins in healthcare education, specifically nursing. I have been a nursing educator now for 3 1/2 years. Williston State College just started a nursing program in my home town (Tioga ND). What I have found is a significant need for increased funding and staff funding in order to continue to put out top notch nurses in the future. Currently our nursing students for instance; they have 2 items to utilize when practicing a skill, one for practice and one for re-demo. This is just not enough equipment necessary for students to have proper practice to enhance their necessary skill sets to be a proficient nursing student. The other issue I have seen is I am currently working as an adjunct instructor which requires my boss to be very diligent in what hours she feels I will exactly be working which makes me as an employee feel like I’m getting paid for 4.5 hours a day but yet I’m here sometimes 8 hours depending on student need which as an instructor that is my purpose, providing top notch students which may require more than the allotted hours set forth to teach a necessary skill depending on the students learning curve. I have seen many qualified nursing faculty leave their positions with the NDUS due to low wages. I have also seen many of my fellow faculty struggle with paying back student loans on a faculty salary due to low wages and no raises. I think we need to focus on keeping not only nurses in the state but also the faculty that educate them. I am scheduled hourly, we get paid for just hours we teach. No lab set up or cleaning or take down of labs, and no laundry service. Student consultations that require extra help are not covered. If a student misses a class and needs to make up a skill this can turn into 1 to 4 hrs. We need scheduled tutoring for second language students that is paid. The number of second language students is increasing and is time consuming before and after class. Many of them are smart enough but our English language is difficult for medical areas. The difficulty is that our language has many meanings for one word. Plus older students and second language students lack confidence and need more help. We need too address these areas in college curriculum and add built in tutoring classes for CNA’s which are badly needed in North Dakota. I am a new faculty in the nursing department and am truly enjoying the next chapter in my nursing career. Having worked for 30 years in the acute care setting of a large teaching hospital in SE MN, and during this time also taught in academia doing clinical and also some lecturing in the community college setting. It was a wonderful way for me to get my feet wet, and realize how rewarding teaching my profession to students was. But the entire time I was doing so, I knew I could not leave the acute care nursing leadership setting for financial reasons. The salary was 1/2 that I was making in my current position as a nurse manager. Also, the tuition reimbursement for both of my advanced degrees from my current employer helped to keep me there, also with offering free CEU’s to help keep my nursing license. Now with my relocation, for a new nursing leadership job and having this not be the right fit for me, or being in a less than professional environment, has landed me in academia at this point in my career. I am currently making 1/2 the salary of what I was making as a nurse leader, and working 9 months out of the year, so would hope to have a bit higher salary. Also, it would be nice to have help with some student loan repayment, as I currently have loans for my terminal degree, which also is a requirement for teaching in higher education. I have been working as a full-time faculty member for the past 8 years. I was encouraged to enroll in a PhD program during my yearly evaluations. I am currently paying on my student loans from my master degree education and now I am taking out loans to fund my doctoral education. I am concerned about paying my loans when I am finished with my PhD. If a salary increase or loan forgiveness program is not an option in the future, I will need to move out of North Dakota. I have been a registered nurse for over 20 years and have over 10 years experience as a faculty in a college setting. I love nursing. The only thing I ever wanted to do as a child was be a nurse. As I grew in my nursing career I realized I could impart my love for nursing to students. I went back to school and spent roughly $25,000 for a Master’s Degree. I am working full time as an Assistant Professor of Nursing within the university system. I make less money with a Master’s Degree than my new graduates with an Associate Degree in Nursing. Every nursing friend I have who would like to further their education has no intention to go into nurse education. Why would they? Does it make sense to spend thousands of dollars only to take a pay decrease and increase your workload immensely? Nursing educators work all day at the office teaching and then go home and correct papers and plan lectures all evening and weekend. Compensation is absolutely unfair and unjust. With a dire need for more nurses why can colleges not find nursing faculty? Because the compensation is ridiculously low and workload is astronomical. I have been teaching 10 years and am currently working with a facility to go back to working the floor. I could work my three scheduled 12 hour shifts, come home and spend my other four days with my family doing things I enjoy, AND MAKE MORE MONEY. Right now I am working 60+ hours. Compensation is absolutely the #1 factor nursing educators are leaving and why nurses are not going back to school for their MSN and teaching. Why have I been here this long, I do love it. I love teaching and I love working with students. But, the compensation is too unfair to continue.